It's that time of year where Danish brand BoConcept releases their new design catalogue for 2019, and I'm always excited to get my hands on a copy. The pages are filled with design inspiration and new pieces for the coming year. These are already arriving in the showrooms, and today I've picked out a few favourites to share with you. 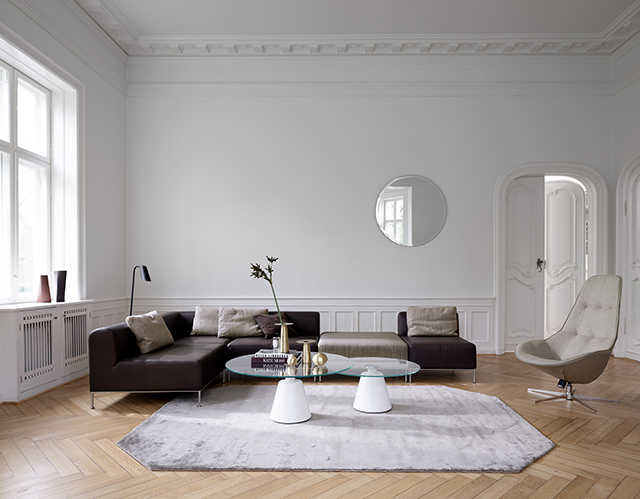 First up is a statement modular design, the Miami sofa, designed by renowned Danish designer, Anders Nørgaard. Sofa demands and tastes change, but a mainstay of contemporary Scandinavian sofa design has long been the modular sofa. The designs offer true flexibility and embody BoConcept?s principle of providing customers with adaptable solutions that fit into their homes and the way they live. With statement looks delivered in a marriage of comfort and simplicity, Miami features thick, pillow-like forms and pared-down details. Gentle curves and the absence of hard edges are calming, while high, broad armrests heighten visual comfort, adding a sense of seclusion. The look is finished with long, clean-styled legs with exposed under-frame; raising the form and giving the silhouette a light stance. The design is built around three module types: a one seater (two size options), a corner unit (with left or right armrest) and a pouf in two sizes.